DSAI 2015 special tracks are sessions organized by high-profile organizers that invite 5-6 authors in a special podium session as part of the conference program. They intend to extend the impact of the conference and promote its main goals, namely: provide a space for debate on new tendencies and software projects for populations with special needs; contribute to the creation of synergies among public and private entities, namely Industry and Universities; to share experiences and best practices. No special track papers are to be submitted through the DSAI 2015 website. The special track organizer must email all accepted authors information to program@dsai.ws, by the general notification deadline. DSAI 2015 organization committee will then send official invitation letters and registration information to the authors. All final papers must be received by the conference final submission deadline and must adhere to the DSAI 2015 final paper formatting requirements outlined at the conference web site at http://www.dsai.ws/2015. The special track organizer’s paper can be reviewed by DSAI 2015 scientific committee upon request. If you have any further questions regarding the special tracks, please contact DSAI 2015 organizing committee via e-mail at program@dsai.ws, with the subject “Special track information request”. 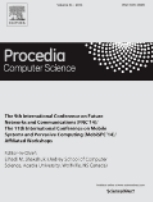 All accepted papers of the conference will be published in Procedia-Computer Science Journal (ISSN: 1877-0509) by Elsevier and will be indexed by ScienceDirect, Scopus, Thomson Reuters Conference Proceedings Citation Index (ISI Web of Science).